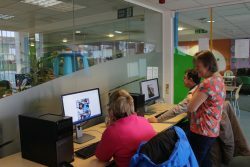 Voluntary Norfolk’s digital inclusion work enables Norwich residents to develop the skills, capabilities and confidence to access online services, support and activities and increase their independence, wellbeing and resilience. The internet and digital technologies provide a lifeline for people who find themselves physically and emotionally isolated. With more than 1 in 10 Norwich adults never having been online, supporting people to develop digital skills can make a real difference in the local community. We work with volunteers who coach local residents to gain new skills and confidence with digital technologies, to help tackle social isolation. If you are interested in becoming part of our team of Volunteers, search ‘Digital Inclusion’ on our Volunteer Portal for current opportunities or contact Emily on 01603 883827 or by email. Read more about the role of Volunteers below. People can lack experience or confidence with digital technologies for a variety of reasons relating to age, health, education or income. We connect people with volunteers who coach and support them to develop their confidence and ability to use digital technologies. Our volunteers work with clients to identify the goals that are important to them, whether that be budgeting or keeping in touch with friends and relatives. The support volunteers provide can involve activities like teaching how to send an email, use a search engine, or fill out an online form. Thanks to our volunteers, people who may have never used a computer, tablet or other communication device have the chance to learn something new. Working one-to-one with residents and support groups in the community, our volunteers enable people to lead fuller, more independent lives. If you are interested in becoming a volunteer for the Digital Inclusion Project, contact the Project Coordinator for more information or express interest via the Volunteer Platform. Any Norwich resident who wants to get digital skills support can take part in this project. If you would like to access a volunteer or know of someone who you think could benefit from some help, please contact Laura Wigby, Digital Inclusion Project Coordinator at Norwich City Council, on 01603 212770. Digital Inclusion Programme is delivered in partnership with Norwich City Council. Visit the Norwich City Council website for further information.